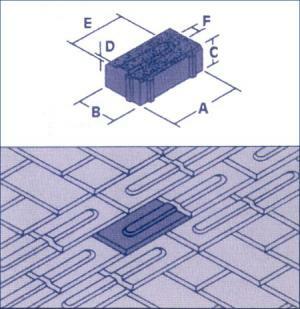 Tactile pavers are designed to provide visually handicapped pedestrians with an easily detectable indicator underfoot. 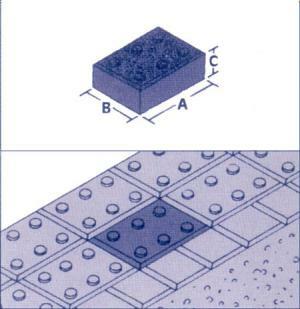 Blister pattern pavers conform to the Department of Transport Disability Unit circular, Jan 1991 - The use of dropped kerbs and tactile surfaces at pedestrian crossing points, and are designed PB classification. They have a work size of 200 x 133mm. There are 57.6 per m2. They are available in Red and Blue. 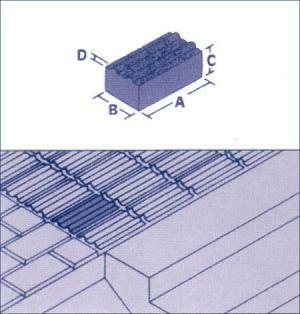 Ribbed or corduroy pavers complywith Building Regulations Approved Document M - Access and facilities for disabled people, and are used to indicate the proximity of a hazard in the footway e.g. steps or an escalator. They are placed at the top of steps and provide a tactile warning. 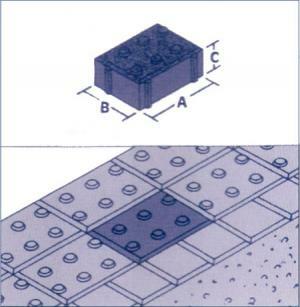 Directional Pavers are non standard units and are laid "back to back" as shown in the diagram.